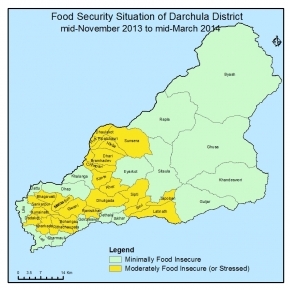 Overall food security situation of the district is minimally food insecure during this reporting period. Out of total 41 VDCs all 10 VDC of cluster A, 20 VDCs of cluster B and 11 VDCs of cluster C are in phase 1. A majority of households are consuming cereals, pulses, milk and oil (bread, beans, milk products and oil) as traditional food habits but food consumption is not diversified. The District Health Office (DHO) record suggests the prevalence of acute malnutrition to be 3.2% in the district; however, this information is based on reported cases of sick children accessing health services, so it is not representative of the general population. Livelihood strategies have remained stable in the district during this reporting period. Normal harvest of winter crop has increased HHs food stock in Cluster A for more than four months whereas in cluster B and C it has supported for three to four months. Key markets have sufficient food stock during this reporting period due to regular supply. No significant change in market price of wheat flour but market price of coarse rice increased by 5%. (Last year avg. market price of rice during this reporting period was Rs. 38/Kg and in this year it is Rs.40 /Kg). Wage labor opportunities were there due to presence of governmental and non-governmental development agencies. This was period for remittance inflow and cash income through sale of vegetable, pulse and firewood. Moreover this was period for collection and sale of NTFP-Yarshagumba. Overall outlook of the district will remain same although there will be seasonal deterioration in food security situation during Shrawan-Bhadra. The situation, however, will improve with summer crop harvest. Summer crops harvest (period Ashwin- Kartik) which is expected to be normal; will increase HHs food stock. Market's will have sufficient food stock due to regular food supply without blockage and wage labor opportunities will be there as development works will be continuous by governmental and non-governmental development agencies. Income through vegetable, milk & it’s product and firewood will be continuous. This will be time of remittance collection as two great festivals_Dashain and Tihar are up coming whereas period for cash income from sale of collected NTFP_yarshagumba for VDCs in upper part of Darchula and people will use traditional livelihood strategies for living.